You know how the built-in speakers on your TV sound kind of like someone took a pair of crummy old headphones and turned the volume way up? That’s because TV makers spend a ton of money improving display panel quality and almost no money improving speakers. The screen is definitely the most important thing, obviously. But crummy speakers ruin the experience, which is why devices like the AwesomeWare Sound Bar are so great. For next to nothing, you can give your TV a nice boost in sound quality so you never have to deal the tinny, hollow sounding speakers on your TV again. ♥LOUD AND VIVID SOUND: AwesomeWare TV speaker adopts dual built-in bass diaphragms and enhanced technology, giving you clean and pure sound. Enjoy your private cinema with friends and family. 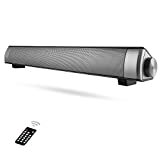 ♥WIRE OR WIRELESS CONNECT: With Soundbar Bluetooth 4.0+EDR, you can operate the soundbar for tv within 30 feet on your phone. Lie down and immerse yourself into the concert just for you. ♥REMOTE CONTROL & TF CARD: Mobile phones unavailable? Easy. Insert a TF card into the surround soundbar and choose your favorite songs with the remote control. ♥EASY CONTROL AND SIMPLE OPERATION: 15 inches compact body and user friendly design, you can operate the soundbar with your eyes closed. ♥EXCELLENT TV SPEAKER: Connect the sound bar via AUX/RCA cable and you can enjoy better sound quality for watching movies ,playing video games and listening to music.